Geoff and Liam Hendriks in the US earlier this year. 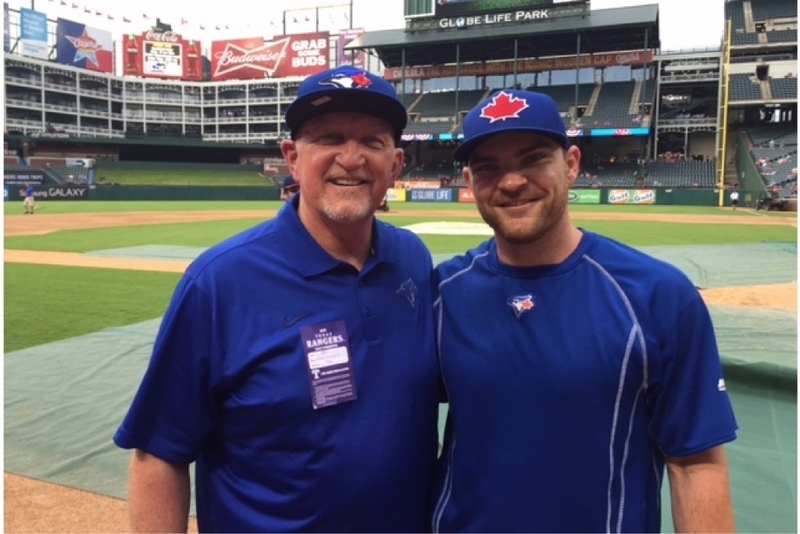 THE Perth father of Major League Baseball pitcher Liam Hendriks has spoken of his son�s record-breaking feat for the Toronto Blue Jays as the side battles Kansas City for a place in the World Series against the New York Mets. Geoff Hendriks, a top sportsman in his own right as a life member of WAFL club West Perth, has had some early starts lately watching from Perth as Liam�s Blue Jays face the Royals in the best-of-seven American League Championship Series as part of the MLB playoffs. Toronto won its second game of the series in the early hours of this morning (Wednesday, US time) to close the gap on the Royals� lead to 3-2 and force game six in Kansas City on Friday (Saturday morning, WA time). Hendriks did not pitch in that outing, but he caused a stir in Game 4 early yesterday when he broke an 85-year-old playoff record for more-outs-than-batters-faced performances. Pitching against his old side, the 26-year-old West Australian returned 13 outs from 12 batters faced during his time on the mound, which began in the second inning. The unlikely statistic arose because he came on with Kansas City at two batters down and had not yet thrown a pitch when he picked off the Royals� Alcides Escobar at second base to end their inning as their third out. He threw for another four innings, in which 12 batters fell to bring his total outs to 13 from 12 batters faced given he faced no batters in the inning he picked off Escobar. Unfortunately for Toronto, Kansas City went on to convincingly win the game 14-2. The former record was achieved by the Cardinals� Jim Lindsey with eight outs and seven batters faced in 1930. Hendriks Snr, while proud of his son, was matter of fact about the achievement. �These things are what come along by, effectively, doing your job,� he said. �When I was talking with Liam (afterwards), he obviously had no idea what records were in place. Mr Hendriks talked of Liam�s satisfaction at being included in Toronto�s playoffs line-up after missing out last year when he was on Kansas City�s roster. He was left out of the Royals side that went on to a losing World Series against San Francisco. �When you play at that level it�s what you aspire to do,� he said. �We�re proud of the boy� the hurdles you�ve got to overcome to compete on that world scene � so few people do it. He said Liam had told him of the unpredictability of his role as a relief pitcher, where his chances of making an appearance are limited to certain situations. And while his son�s living centred on America�s favourite pastime, he still found time to kick the football around the ballpark in the lead up to games. As a teenager, the former Sacred Heart College student was touted as an AFL prospect before his baseball talents took him to the US. Mr Hendriks, a WA scout for the Sydney Swans, said the only issue with his son�s pre-game ritual was finding someone who could kick the ball back. �They�re still trying to find people in the club to kick with him,� he laughed. Hendriks, the fifth Australian to feature in an MLB post season, is hoping to become only the second to win a World Series ring after Sport Australia Hall of Fame member Graeme Lloyd�s two rings with the New York Yankees in 1996 and 1998.